By now you know my love for pretty little details, so it really comes as no surprise that this includes scallops. Scalloped hems, necklines, and trim -- I'll take them all. They're so distinctively charming and feminine! Adding just one scalloped piece to your outfit is sure to make it stand out, so the key is to keep the rest of the look clean and streamlined; you don't want to overdo it! Another small style tip: be discerning about the size and layers of the scallops; if they're too large, tiered, or voluminous, they can quickly become overwhelming and unflattering -- no thanks. Instead, if the scallops are layered or tiered, try choosing a closer fit to the body so that they skim and flatter; after all, you want them to be fun and flirty, not frumpy. I'm so happy to see that this scalloped fashion trend is here to stay! I'm seeing it across several of my favorite retailers/brands: Ann Taylor, Banana Republic, J.Crew, Kate Spade, Macy's, Nordstrom (to name a few.) All the pieces I've rounded up here have already made their way to my Spring wish list. 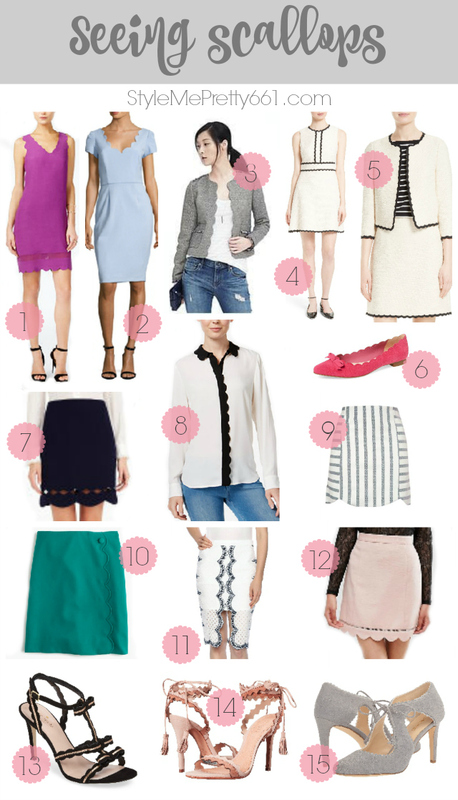 Remember the scalloped blouse (#8 above) that I included in my Spring Cravings post? It's the same style as the blush one I bought from Banana Republic last year but at a fraction of the price. I had wanted the black and white one as well, which was identical to this one, but the petite sizes sold out too quickly. Now, I'm thinking I need this one! I'm also completely smitten with this Kate Spade scalloped tweed collection, which I also included in my Spring Cravings post. It's definitely on the pricey side, but so lovely and timeless! What about you, are you sweet on scallops, too? Which of these are calling your name? P.S. I'm still working on my other outfit post (sneak peek from my Instagram here) which should be up on the blog soon!